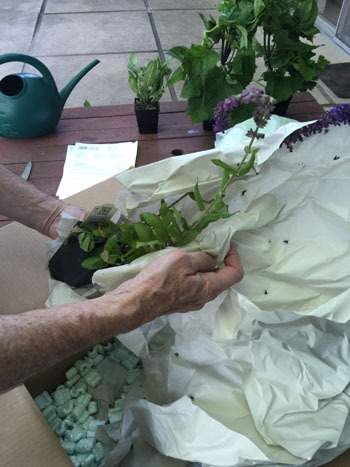 Ask Mr. Sage: What Is Shipping in Boxes Like for Salvias? I love Salvias and just discovered your online catalog. You have a lot more varieties than my local garden center. But I've never ordered garden plants online, and I'm worried about what my Salvias will be like after spending time in a shipping box. How are they packed? What will they look like when I unpack them? 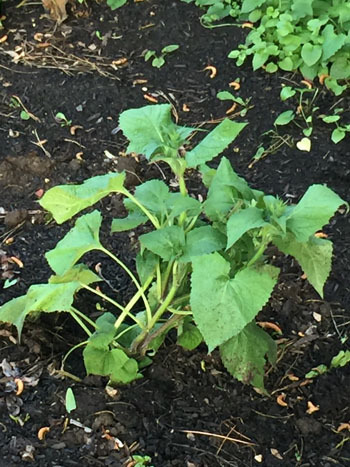 Should I plant them right away? Not to worry! We understand your concerns. 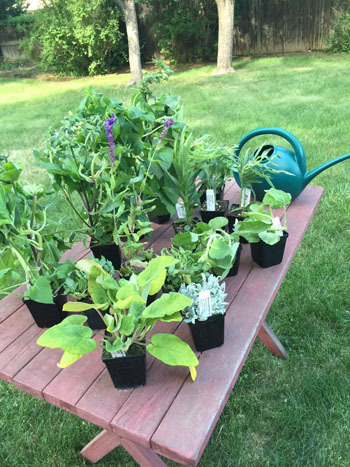 A lot of our first-time customers are also new to shopping for live plants online and ask similar questions. 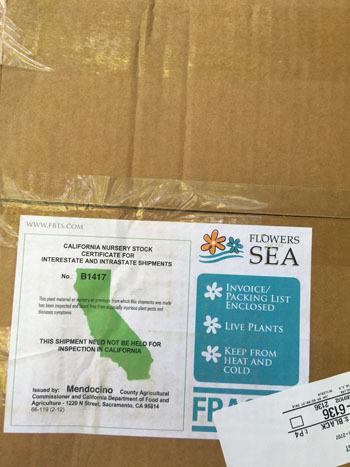 We can't speak for all mail order plant nurseries, because packing and shipping procedures vary, but Flowers by the Sea Online Plant Nursery is exceedingly careful to make sure your plants arrive in healthy condition. It's important to know that Flowers by the Sea Online Plant Nursery only ships well-developed sages that are ready for garden planting after you harden them off in partial shade for a few days. Our shipping procedures require customers to select a delivery method that will ensure arrival of their plants within three days of shipping. On rare occasion, shipping delays may cause deliveries to arrive four days after shipping, but the plants should be fine. UPS provides reliable package tracking that includes an email alert the week of delivery. 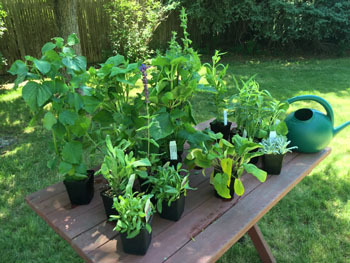 Buying Salvias Online from FBTS: Unpacking & Planting. However, as the saying goes, a picture is worth a thousand words. Here are some step-by-step photos illustrating the unpacking process and results. A satisfied customer in the Mountain West Region sent them to us to share with readers. Three-day ground shipping works well in most of the Rocky Mountain states. When our shipping box arrives on your doorstep, open and unpack it immediately. If you will be away at delivery time, ask a neighbor to take the box in and store it in a cool room. Truly wonderful neighbors sometimes will unpack the box for you. Here is what your order looks like when you open the box. It will contain a paper listing the plants in your order. Compare the contents of your box to the packing list. 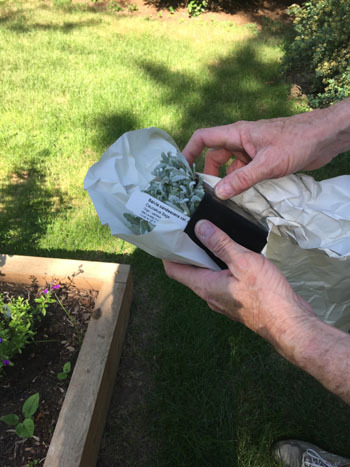 Gently remove and unwrap each plant. Check each plant's soil for moisture. Water the ones that feel dry, but don't soak them unless they are water-loving species or they have become bone dry. 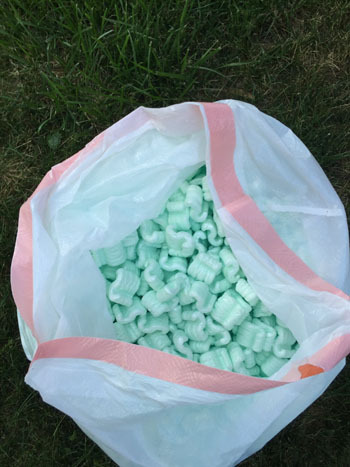 This is what our customer's Salvias looked like after unpacking. After two days of hardening off in partial shade, the Salvias had perked up and were ready for planting. Notice the tall, slender sage four plants back from the front corner of the table. It is Prairie Sage (Salvia azurea). The floral spike behind it is from a Meadow Sage. Yes, sages can start blooming during shipping. 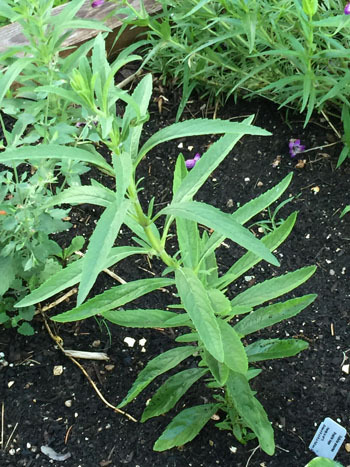 Here is the Prairie Sage filling out and thriving a week after planting. 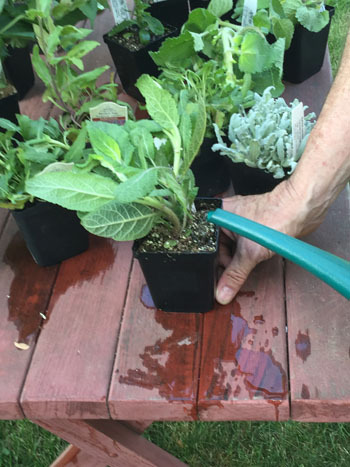 Our customer was worried that her Shinano-akijiri (Salvia koyamae) was looking limp from too much watering. But it is a true water lover and, in this photo, looked much happier following a good rain. 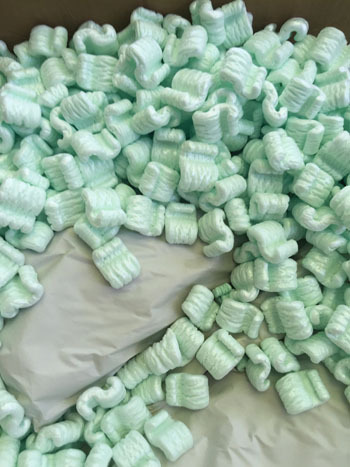 Store the Styrofoam packing peanuts for reuse when you mail packages or give them to a UPS Store. 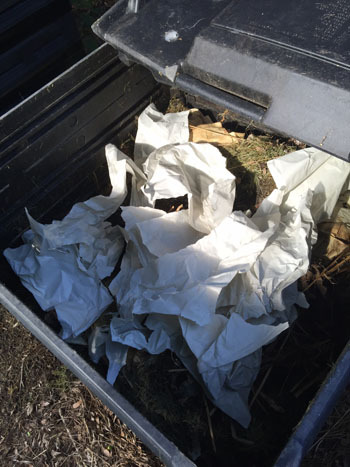 Newsprint breaks down rapidly in compost heaps. Or you can add it to your paper recycling bin. Finally, if you want to read customer opinions about specific plants and concerning purchases from FBTS, check our product reviews. We never pay or offer credit for reviews, because that wouldn't help us or you. Please call or email us if you have more questions about FBTS ordering and shipping or our plants. Also, contact us immediately if you ever experience shipping problems.